It is with great sadness that we announce that longtime faculty member Dieter Schroder passed away on Monday, December 24. 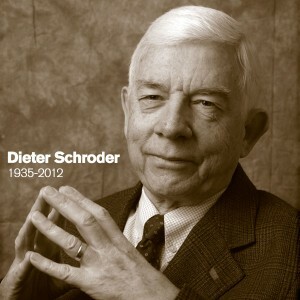 Dieter was a well-known scholar and textbook author, and popular mentor and teacher. During his more than 30 years of service at ASU, he received numerous accolades including being named Regents’ Professor and Outstanding Doctoral Mentor. He played a significant part in shaping our engineering school and establishing ASU as a leader in solid-state electronics. Dieter was a professor in the School of Electrical, Computer and Energy Engineering and served as deputy director for our NSF/DoE-funded Quantum Energy and Sustainable Solar Technologies (QESST) engineering research center, and he previously directed the Center for Low-Power Electronics. We have been fortunate to know Dieter as both a colleague and friend, and to benefit from his international reputation and contributions to Engineering and ASU. He will be missed. A memorial service is planned. Details will be shared via In the Loop.